A chance for PC gamers to experience the best of the last generation of console games. Tyler Wilde provides context and commentary followed by the full, original text of our Metal Gear Solid review, published in the December 2000 issue of the US edition. Metal Gear Solid V: The Phantom Pain is coming to PC ! The last Metal Gear game to release on PC was Metal Gear Solid 2: Substance over 10 years ago (unless you count Revengeance), and before that, Metal Gear Solid, which was published on PC by Microsoft a couple years after its PlayStation release. That delay is largely to blame for MGS' sub-80% score (imagine a PS3 game releasing on PC now without any upgrade), but as our original review makes clear, it's a great game. I think Li C. Kuo was right to call Metal Gear the PlayStation's Half-Life. Speaking of which, Metal Gear Solid 3 cruelly released just a day after Half-Life 2, and became my favorite PS2 game (after I was through HL2, of course). I'm excited that MGSV may become one of my favorite PC games. Let's just, uh, play down the 'distracting guards with swimsuit models' thing. That's dumb. How are the guards so dumb? More flying goats , please. As a devout PlayStation guy back in my college days, I loved Metal Gear Solid. It was a great interactive cinematic experience, with incredible in-engine cutscenes, and a storyline head and shoulders above typical videogame fluff. 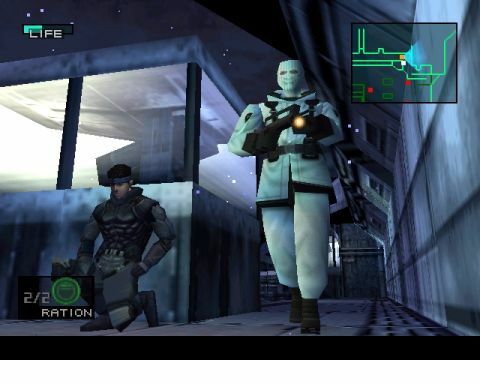 Some would even say that Metal Gear Solid is to the PlayStation what Half-Life is to the PC. In Metal Gear Solid, you take on the role of Solid Snake, a special forces operative brought out of retirement to resolve a terrorist situation in Alaska. It appears that an elite group of "Next Generation Special Forces" has taken over a nuclear weapons depot and plan on popping off nukes if the U.S. doesn't give in to their demands. These soldiers-gone-bad are a collection of eccentric and specialized commandos, each with their own weird name. There's Sniper Wolf, a deadly and beautiful sharp shooter; Vulcan Raven, a guy who carries a massive vulcan mini-cannon strapped to his back; Revolver Ocelot, master of the quick draw, and many more. Your job is to infiltrate the facility and take them down. The story unfolds through a mix of in-engine cutscenes brimming with Hollywood production values, audio dialogue through your Codec (a communicator built into your character's ear), and full-motion video. Most of the game is played from an overhead perspective (with the exceptions of when you're using binoculars, using the Look button to scope out an area, or sniping). Control is best with a gamepad, though is a bit sensitive in first-person mode, making aiming cumbersome. Metal Gear Solid is a sneaker at heart. While you will find yourself in wild firefights , most of your time is spent avoiding the enemy. To make things easier, a personal radar system tells you where the guards are and what their cone of vision is. You'll need it, because these guards are smart. They follow footprints, hear you when you step in puddles, and see your breath in the cold. However, there will be times when detection is unavoidable. In these situations, Snake can punch out guards or even grab them and break their necks. As you get further in the game, you'll eventually scrounge up an impressive arsenal, including remote-controlled missiles, assault rifles, and even claymore landmines. Trust me, you'll need every bit of it. About 99 percent of the PlayStation game is intact, and a few extras have been thrown in. FIrst off, if you start a game on the "very easy" setting, you'll have the silenced MP5 with unlimited ammo in your inventory right off the bat. You'll also be able to play in high-res mode. Sadly, Microsoft didn't add any more polygons, or bump up the texture resolution (at least not in any noticeable way). As a result, some characters are blocky, and the textures look stretched out. There's no force feedback support, either. Thankfully, some great console touches have been recreated. For example, there's a certain boss who can read your mind. In the PlayStation version, to beat him you had to unplug your controller and put it into the second slot. Then you were able to hurt the boss because he could no longer "read your mind." This was translated perfectly to the PC without the need to unplug your controller. I won't give away the secret, but I must applaud Microsoft on a job well done.